I had the pleasure of spending a week with many talented and knowledgeable food bloggers recently. We spent a week talking about so many things, how to write recipes that will make you run into the kitchen to make what we are seeing, and we spent time making new friends. One thing is for certain, I will never again be able to eat guacamole without thinking of the wonderful people I met at the food blogger camp. I will also be looking forward to the food blog camp next year! One of the dishes we ate while we were at Club Med was the Guacamole. Guacamole in Mexico is creamy, rich, and decadent. Fresh avocados that haven’t spent their ripening time on our window sills, tomatoes that ripened on the vine, and wonderfully pungent red onions make the guacamole a dish you want to dip into at every meal. I think most of us had the guacamole three times a day. While I can’t bring back that guacamole back, we all can make guacamole fresh anytime we desire to have a taste of Mexico. Guacamole is made with fresh avocados. Choose avocados that are firm to the touch, but have a slight give to them. Selecting avocados that are too firm will give you guacamole that isn’t very flavorful. Select the ripest tomatoes as you can. You can learn more about selecting the proper avocados by going to the California Avocado Commission. Guacamole in Mexica is mana from the gods. Wash the avocados, cut in half, and remove seed, and peel. Coarsely chop the avocados and place into a bowl. Add lime juice, stir the avocados and lime juice together, coat well, as this will help to prevent browning. Add in salt, jalapenos, cilantro, garlic powder, and gently mash the avocados breaking the coarsely chopped chunks into smaller pieces. You will want to completely mash about one-half of the mixture before adding the red onions and tomatoes. Stir to combine well. Cover bowl with plastic wrap, and refrigerate for at least 30 minutes before serving. You can learn more about selecting the proper avocados by going to the California Avocado Commission. I had to make tacos and pina coladas for dinner last night to satisfy my Mexico cravings! Guacamole is next though. Such a pleasure to meet you Stephanie, and looking forward to seeing you again. That recipe looked so good that I added avacados to my shopping list for the day. They looked horrible but I had Guacamole burned into my mind so I bought ready made in the produce section. Shame, shame on me! I added onion, tomatoes and cilantro and it was pretty good. 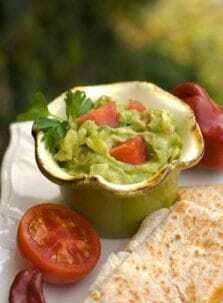 One tip on fresh guacamole; place plastic wrap on the surface of the dip and then cover the bowl with more. It helps it keep it’s color. Another “color-keeping” tip is to keep one of the avocado pits in the bowl with the guacamole until it’s ready to serve; the natural chemicals in the pit prevent oxidation. I love your color saving tip! Ah yes, the guacamole….I’m still dreaming of it too. What a great week! it was very nice to meet you at Club Med, Ixtapa. I will have to make guacamole sometime this week. I got seriously addicted. They should have rationed it out the last couple of days. I so miss the fresh guacamole. It was cruel to turn us unto junkies, just to send us on our merry ways. I’m not going to the market until Wednesday or Thursday and am down to my last onion, a few chicken breasts, a couple of small crowns of broccoli, a can of cannellini beans and a whole lotta condiments, but all I want now is guacamole! I might have to lick the screen to satiate my craving after looking at your post.